"Vagrant is a tool for building complete development environments"
"Create a single file for your project to describe the type of machine you want, the software that needs to be installed, and the way you want to access the machine. Store this file with your project code. Run a single command "vagrant up" and sit back as Vagrant puts together your complete development environment"
The virtual machine that Vagrant brings up has access to the files on your main (physical) machine. you can edit your files on your main machine using your favorite text editor or IDE. when you start a web server on the virtual machine, you can access your app in the browser on your main machine. I will demonstrate this in a minute. 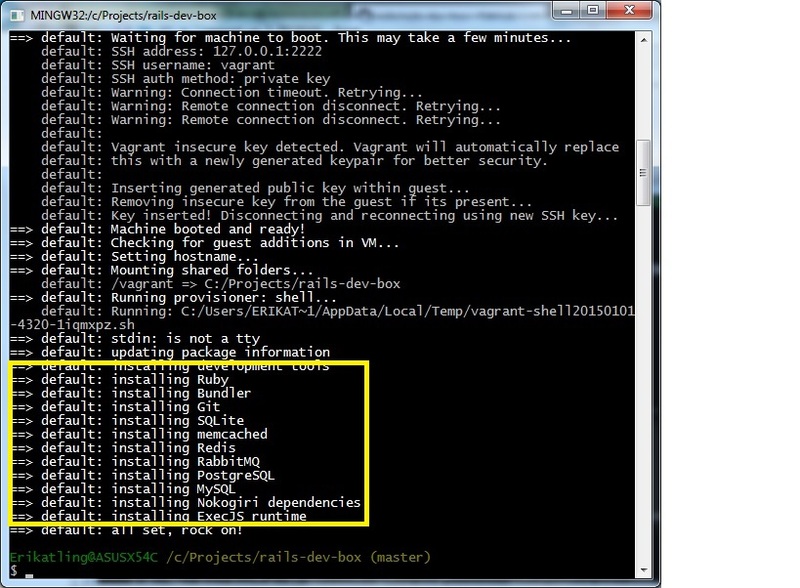 Get an already existing Vagrant file. Best of all, rails-dev-box is not just for Rails or Ruby! You can install any programming language or framework on it -- Python, Node, you name it. 1. Install VirtualBox -- the software that enables creation of virtual machines on your computer. Install Rails, or any language or framework you want: Python, Node, Java, etc.